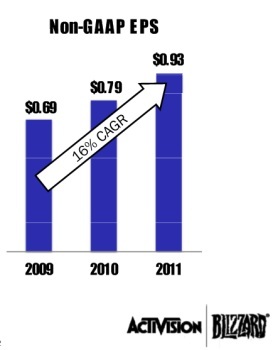 2011 was another great year for Activison, which raked in more than $4.7 billion in revenues. Here's something to think about the next time you find yourself irritated, frustrated or flat-out angered by Activision's business practices and insistence on keeping Bobby Kotick at the helm: in 2011, the publisher raked in $4.755 billion in GAAP net revenues [$4.489 billion non-GAAP], saw its earnings per share grow by a record-setting 17 percent and achieved a GAAP operating margin of 28 percent [30 percent non-GAAP], also a record. It also generated nearly $1 billion in operating cash flow. 34 percent of Activision's total revenues for 2011 - $1.6 billion - came from digital sales, including World of Warcraft, which ended the year with 10.2 million subscribers, and also Call of Duty Elite, which now boasts over seven million registered users, including more than 1.5 million people who paid $50 for the "annual premium" subscription. Call of Duty: Modern Warfare 3 was the best-selling game of the year and became the first and so far only entertainment product to break the $1 billion mark in 16 days, besting the record set by Avatar by one day. Perhaps unexpectedly, Skylanders: Spyro's Adventures was not only the number-one kids game for the year but also "the biggest new IP launch in Activision's history," according to Kotick. Even Call of Duty: Black Ops, which came out in 2010, is still selling like gangbusters and managed to be the fifth-best-selling title in dollars in 2011. Activision's outlook for 2012 is pretty much all sunshine and lollipops too. The Call of Duty: Modern Warfare 3 Content Collection, a bundle of DLC previously released to CoD Elite premium subscribers, comes out in March and two Blizzard products, presumed to be Diablo 3 and Blizzard DoTA, will also be out later this year. The company's outlook for 2012 calendary year is $4.15 billion GAAP and $4.5 billion non-GAAP.